Dallas Criminal Defense Lawyer John Helms explains the serious penalties for voting fraud in Texas. Voting is one of the most fundamental American rights. Normally, most people don’t really think about voting unless an election is approaching. Arguably, voting fraud wasn’t on many people’s radar until recently, when it became something of an issue in the last presidential election. In recent years, there have been news headlines about cases of voter fraud. 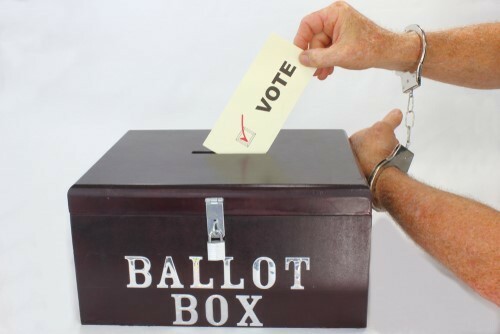 In some instances, people have been convicted of violating the law when they vote or attempt to vote. This has some people asking just how serious the penalties for voting fraud are, as well as whether they should be concerned about possibly violating the law if they attempt to vote without being aware of their voter registration status. “Voting fraud,” which is also sometimes referred to as “election fraud,” is an umbrella term that can be used to describe a variety of criminal offenses. For example, it’s against the law to stuff the ballot box or to purchase another person’s vote. It’s also a crime to vote more than once in an election or to cast a vote when you’re not properly registered, don’t live in the area where you’re voting, or you’re otherwise prohibited from voting. It can also be a crime to impersonate someone else when you vote, such as using a deceased person’s information for the purpose of casting a vote. In some cases, people engage in voter fraud not because they necessarily have bad intentions, but because they believe they’re doing something positive and perhaps even patriotic. For example, in Texas, two election officials were charged with conspiring to cast a vote for a third person who couldn’t vote because they were going to be out of town on election day. According to a 2016 investigation conducted by Houston Public Media, voter fraud is quite uncommon. Since 2002, the Texas Attorney General’s Office has pursued fewer than 90 cases involving voter fraud spanning over 64 million votes. In the cases the state pursued, just 70 resulted in a voting fraud conviction. This means that for the 64 million people who voted, just 70 voted illegally. Experts point out that it’s actually quite difficult to engage in voter fraud, especially if the person is voting in person. As one official noted, an individual would first have to obtain some form of fake identification. Experts also state that if a group of people wanted to have a significant impact on the outcome of an election, they would have to engage in a substantial and far-reaching conspiracy. Despite the relatively low numbers of legitimate voter fraud cases out there, the idea that there is widespread voter fraud remains heightened. There have also been several high profile voter fraud prosecutions in recent years. This is why it’s important for voters to know their rights, and to know the law when it comes to voting. One voter fraud case that dominated headlines involves a Texas woman who says she didn’t intend to vote illegally in the 2016 presidential election. Recently released from prison for a tax fraud conviction in 2012, the woman also said she wasn’t planning on voting, but her mother urged her to cast her ballot. Because the woman was still on community supervision at the time, however, she was not permitted to vote under Texas law. She claims her probation officer didn’t tell her she wasn’t allowed to vote, and that no one had informed her of the prohibition against felons on community supervision casting a vote. When she arrived at her polling place, her name wasn’t on the voter rolls. However, a polling worker assisted her and gave her a provisional ballot. She has said she intends to appeal her conviction. Her case made headlines because of what many felt was a disproportionately harsh sentence compared to the offense. She was indicted for illegal voting, found guilty, and sentenced to five years in prison. In a separate case, a woman in Texas who lives in the U.S. with a green card was sentenced to eight years in prison because she marked herself as a “citizen” on her ballot. She stated in court that she was confused about her rights and thought she had the right to vote as a legal permanent resident. These lengthy sentences demonstrate why it’s important for anyone who has a previous criminal conviction to know their rights before casting a vote. It’s also important for people who have been accused of voter fraud to contact an experienced criminal defense lawyer. Prosecutors have shown they’re willing to pursue the maximum penalty for voter fraud. Your future is too important to leave to chance. If you’ve been charged with voting illegally, it’s in your best interest to speak to a lawyer.